Paul joined the firm's Toledo office in 1991, litigating railroad, medical malpractice, product liability, and insurance coverage cases. In 1998, as part of the Toledo office's merger with Dell & Dell of Tiffin, Ohio, Paul moved to our Tiffin office to work with partner (and Paul's wife) Jane Dell. In the Tiffin office, Paul's practices civil litigation, corporate and transaction work, wills, trusts, estates and estate planning, and real estate. Paul advises numerous clients, mostly operating smaller businesses, on formation of companies, contracts addressing a variety of transactions, and the sale of companies, divisions of companies, and substantial company assets. In real estate, Paul has negotiated and prepared commercial and residential leases, participated in the sale and purchase of commercial and residential properties, and litigated real estate issues including boundary line disputes, adverse possession claims, and misrepresentation claims. Paul has drafted wills, trusts, and powers of attorney, administered estates, and litigated estate disputes and will contests. Paul's other civil litigation work includes contract disputes, personal injury and wrongful death claims. Tiffin's partnership with the Toledo and Buffalo offices allows the Tiffin office to handle complex disputes and transactions that often cannot be handled by firms in smaller towns. The Toledo office has provided important litigation support, and the Tiffin and Toledo partners have established a strong working relationship on trusts, estates, taxation and corporate matters. Paul is a 1990 graduate of the Indiana University College of Law where he spent a semester as a judicial intern to the Honorable Kennard P. Foster of the United States District Court for the Southern District of Indiana. Following graduation, Paul served as judicial law clerk to the Honorable John R. Evan of the Ohio Court of Appeals for the Third Appellate district. 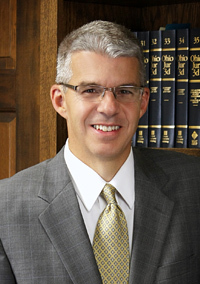 Paul is licensed to practice in state and federal courts in Ohio and Illinois. In addition to Paul's legal practice, Paul serves several community organizations. He is the Chairman of the Board of Trustees for the Tiffin Charitable Foundation which manages charitable assets in excess of $10,000,000.00. Paul is a member of the Board of Trustees for Tiffin Theatre, Inc., which operates the Ritz Theatre in Tiffin, a regional performing arts center. Paul actively participates in the Tiffin Rotary Club having served as president, chairman of the Rotary three day, televised auction, and as a member of the Club's foundation board of trustees. Paul and Jane have served on committees for local schools, church festivals, charitable raffles, and non-profit boards. Seneca County, Ohio State, and American Bar Associations.